Splendid One of a Kind Home With 2 Outdoor Spaces! Tucked in desirable and convenient Jeffries Point this stunning condo feels more like a spacious single family home. With a private entrance and two levels of extraordinary living space you will love the layout and incredible flow. On the upper level there is an open concept living and kitchen area with high ceilings, floor to ceiling windows, hardwood floors and stylish details throughout. 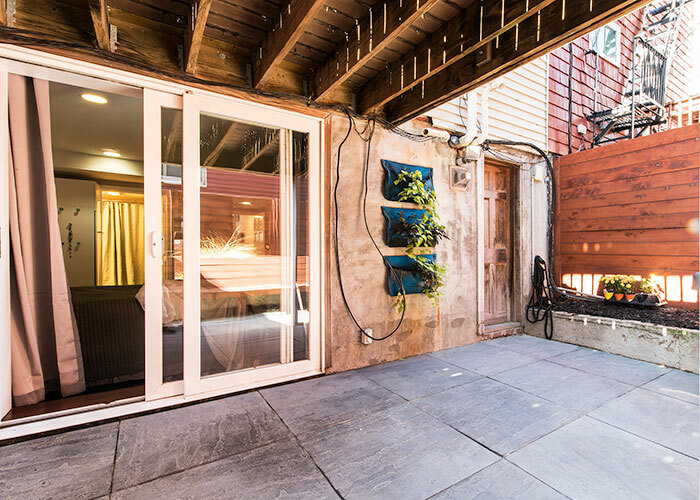 A half bath and private deck are sure to please you and every inch of the space is used perfectly. The kitchen features stainless steel appliances, sleek granite countertops and terrific cabinet space. The breakfast bar is ideal and pulls the whole space together brilliantly. Walk down a lovely staircase and be ready to be WOWED with a charming master bedroom, contemporary bathroom, laundry and the most amazing over-sized private terrace that becomes your very own sun-splashed urban oasis in this city home. Ideal for morning coffee, basking in the afternoon sun and sipping your evening wine this space is truly a treasure for peace and relaxation.The neighborhood is exciting, close to Piers Park, the stunning Waterfront, Sailing Club, shops, restaurants and the Blue Line T. Easy airport access and quick tunnel travel makes it so easy to call East Boston home. And we promise that this unique, spectacular and one of a kind home will dazzle you the moment you walk in the door!